You have a Mail app in your iOS device and you are not using it? It’s like you have payed for something and then just ignored it. Well, not until now coz I’m going to teach you how to simply add an e-mail account: Yahoo!, GMail, MS Exchange, MS Hotmail, Aol, and iCloud on your iOS Mail app. I’m concluding that you already have an existing one. With this, you won’t have to go and log-in to the website anymore – just launch the Mail app and all of your messages will be downloaded seamlessly (of course you’ve got to have a fast Internet connection too!). List of available mail services are listed. Choose what account you want to add. For example you want to add a Yahoo! mail account. Just put your full name, email, and password. You may leave the description at this moment. After successfully configuring your email account, open your Mail app and all of your inbox(es) will be downloaded automatically. 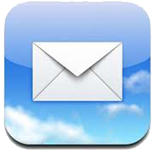 Now you can receive and send e-mails through your iOS device. That’s how simple it is. This entry was posted in Geek Stuffs and tagged email, iphone, mail, tutorial. Bookmark the permalink.